Website and processes: 17 Dec 16 Dawm, 5/5 Excellent "very efficient service"
Initially you will be given an informal, non-technical briefing describing how an aircraft flies and how we control it in the air. You needn't worry if this is new to you as we cover the subject at a very basic level only. Flying time and Air Traffic Restrictions permitting we may also be able to arrange to overfly your house. This is a unique experience and you are more than welcome to take cameras into the air. 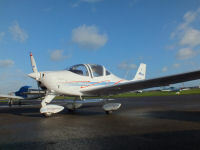 After the flight there will be a de-briefing, more photographs if you wish and a presentation certificate for the flyer. We are open 7 days a week giving greater flexibility for you to fly both midweek or at the weekend. Children under the age of 18 years require parental consent. The voucher will have Nottingham printed on it, but it can be used from..